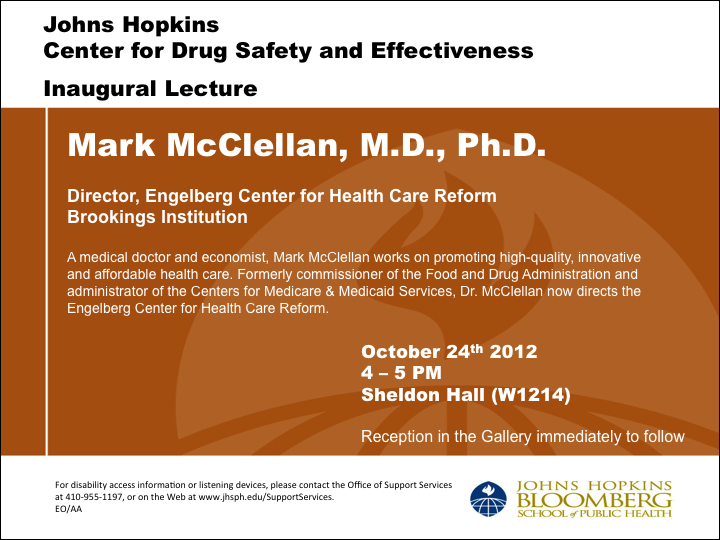 On Wednesday, October 24, we will launch the Johns Hopkins Center for Drug Safety and Effectiveness, a collaborative effort of the Bloomberg School of Public Health and Johns Hopkins Medicine. The Center will fulfill its mission by supporting individuals engaged in research, training, clinical programs and public service to optimize the safe and effective use of prescription medicines in the United States and around the world. We are delighted that Dr. Mark McClellan will deliver the inaugural lecture for the Center on October 24 at 4:00 PM, with a reception to follow.